Climbing the mountain of Huayna Picchu is one of the highlights and the most popular activity when visiting Machu Picchu. This ticket gives you general access to enter Machu Picchu at 08h00 and climb the mountain of Huaynapicchu at 10:30am. The entrance to climb Huayna Picchu is inside the citadel of Machu Picchu. You must be at the Huayna Picchu entrance checkpoint between the hours of 10:30am - 11:30am. You are given maximum time of 3 hours to complete climbing Huaynapicchu mountain. You are also allowed time to explore the citadel of Machu Picchu either before or after your climb to Huaynapicchu mountain. 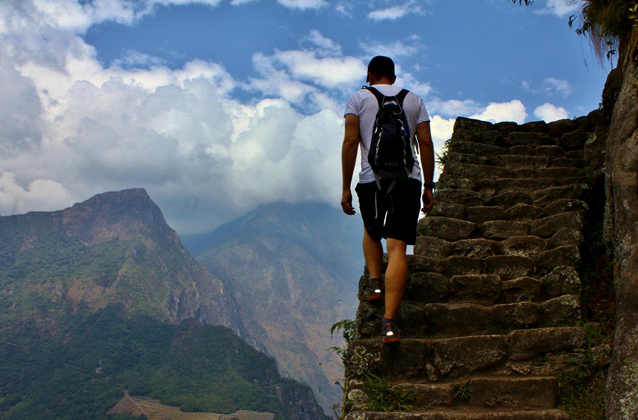 You don't need a guide to climb Huaynapicchu Mountain. But you must be accompanied by an official guide the entire time you visit the citadel of Machu Picchu. Please hire Machu Picchu a guide ahead of time to avoid last minute problems. Your ticket to Machu Picchu must be printed on paper. Your Machu Picchu ticket will not be accepted from a cell phone or mobile device. You must also provide your original passport. The name on your passport and your Machu Picchu ticket must match. All of the Machu Picchu tickets are non-transferable and non-refundable. All Machu Picchu tickets are valid for 1 day only, for the date and times stated on the ticket. You can not re-enter Machu Picchu once you leave, so please be sure to be prepared to stay inside all the time. Please plan ahead as there are no bathrooms inside Machu Picchu. And no food is allowed inside Machu Picchu in order to preserve this world wonder for future generations.